Margaret (?) married Virge Haughton. Anna Mavor married John C. Houghton, son of Solomon Taylor Houghton and Catherine G. Albee, in Jun 17, 1873 at Fairbury, Jefferson Co., NE, USA, Book A, p. 9. Mary Keith married Charles Alexander Houghton, son of Henry Houghton and Lucretia Pooler, in May 13, 1876 at Blair, Washington Co., NE, USA, mar 17 years in 1900 census. Lorena May Houghton married Paul L. Sternenberg. Lorena May Houghton married Guy Plank. Belle (?) married Elmer Houghton. Alice A. (?) married Lester Houghton, son of Delos W. Houghton and Dorcas P. (? ), in circa 1868 mar 32 years in 1900 census. Jacob Lester Houghton married Mary A. Reynolds in circa 1916 age 39 and 34. Samuel Haughton married Angeline W. (?) in circa 1867 mar 33 years in 1900 census. Angeline W. (?) married Samuel Haughton, son of Aaron Haughton and Harriet Derwent, in circa 1867 mar 33 years in 1900 census. Earnest Harlan Haughton married Julia (?) in circa 1902 mar 8 y in 1910 census. 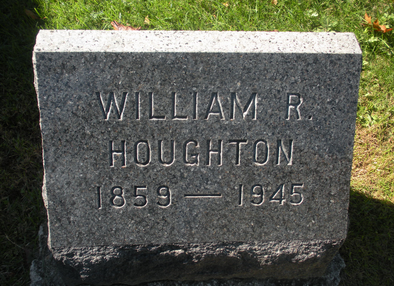 William R. Houghton married Addie May Barber in Nov, 1890 at Center Moriches, Suffolk Co., NY, USA, mar 9 years in 1900 census; age 29 & 19. David Huntington Houghton married Katherine I. Streeter in May 16, 1906 at Point of Rocks, KS, USA. Andrew Haughton married Manning Gossum in Jan 13, 1873 at Chowan Co., NC, USA, he age 29, she age 21. Andrew Haughton married Venus Pallon in between 1894 and 1897 Mar 6 y in 1900 census; 13 y in 1910 census; his second. Manning Gossum married Andrew Haughton, son of Alexander Haughton and Lettice (? ), in Jan 13, 1873 at Chowan Co., NC, USA, he age 29, she age 21.